Read on to learn about Josh's business journey, how chickening out may have been a blessing in disguise, and why making the ask could help you stand out in a crowded market. I've been an entrepreneur for 18 years now. I call myself a serial entrepreneur as I am constantly into something new. I've been a wedding & portrait photographer, a greeting card designer, an intentional parenting blogger & a breathwork healer/reiki master. I realized that a) I love holding space for people, b) letting others know they matter & have unique gifts to offer the world & c) finding freedom to spend quality time with my wife & kids. At one point in my photography career I really wanted to speak at WPPI, a wedding photography conference in Las Vegas. I had connections to some of the speakers as well as the people who'd put the conference on, but in the end I didn't ask. So I don't know whether I would've been able to speak or not. Looking back, I also don't know if that was the path I wanted to really take for my career anyways, so maybe chickening out was a blessing? The past 15 years I've been an active meditator. As far as habits go, meditation has been the biggest contributor to who I am as a person these days & how I look at life...the awareness, acceptance the contentment. Anyway, the last few years I've been digging deeper into studying/training/learning all about the breath and how we can positively affect our bodies by doing breathwork practices. It's been scary to reach out to yoga studios to ask about leading classes for their communities. More often than not I either get a no or they ignore my message. But there have been a few times studios have said yes. This wellness space is crowded with so many different types of stuff the information is overwhelming & I'm a relatively unknown in that space. I feel honored when I get to lead my breathwork classes. Probably when I asked my wife to marry me 15 years ago. We've been together since I was 15 & she was 14. My life has been full of so many adventures, ups & downs, unexpected turns, hard stuff, good stuff & so much more. Having a partner who has been by my side for over half my life has helped me understand what true, unconditional love is. She's been my shoulder to cry on when I've needed one. She's been sources of courage & bravery & the encouragement I've needed to keep going. I don't know what my life would look like without her right next to me. Don't be afraid to shoot your shot. There are so many people in the world. Some of them will get you. Some of them won't. 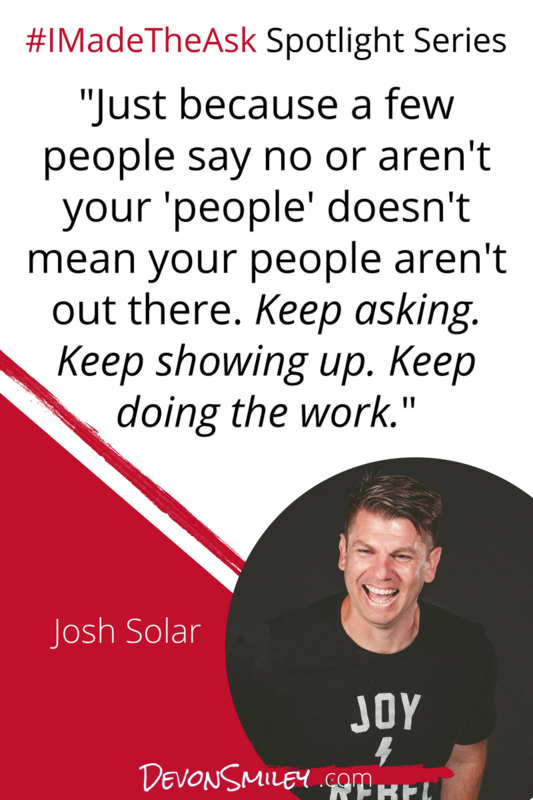 Just because a few people say no or aren't your 'people' doesn't mean your people aren't out there. Keep asking. Keep showing up. Keep doing the work.